It's tempting to view the current crisis over separating migrant families at the U.S.-Mexico border as an example of a bureaucracy run amok, or even as made-for-media power politics between Congress and the President. Unfortunately, at its core it is neither of those, but rather something much more sinister: the first stirrings of out and out tyranny. Tyrannical rule often begins this way, as something that looks like a mistake--perhaps over-excited law enforcement people or confused bureaucrats or even inter party conflict. That's the way it was in Argentina in the 1970s, when young people began mysteriously disappearing in night-time arrests by paramilitary and secret police. By the early 1980s, as the total of disappearances approached 30,000, it became clear that the disappearances were no mistake. We've seen another example of exploding tyranny in Turkey, following a 2016 coup attempt. At first, it seemed like the usual response to a failed coup, with generals and high-level government officials being arrested. But as the months went by, and the detentions and arrests expanded from 10,000 to 20,000 and eventually to more than 100,000 this year--including university professors, journalists, and judges--it became clear that something much more than a response to a coup attempt was occurring. Unfortunately, America's sudden fixation on separating migrant children from their parents bears similar hallmarks of tyranny. Key among these qualities are lots of seeming confusion and double talk by government officials, and finger pointing about the origination and rationale for the heavy-handed policies. A major goal of the confusion is to promote secrecy. If you listen closely to reports from NPR and CNN, you learn that reporters don't know such basics as how many centers there are to house children separated from their parents. Even prominent politicians seem unable to extract significant amounts of information. 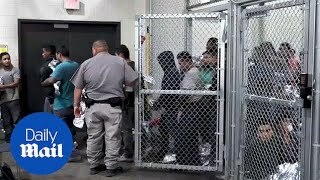 Reporters and politicians were allowed a short tour of one facility in Texas--which you figure has to be the most attractive facility since it is being used as a model--and that became the main source of reporting, since no one was allowed into other centers. Some reporters characterized the model center housing young children as a bunch of "cages." More important, parents of children taken away have little information. NPR reported: "According to the Texas Civil Rights Project, which has been able to speak with detained adults, multiple parents reported that they were separated from their children and not given any information about where their children would go. The organization also says that in some cases, the children were taken away under the pretense that they would be getting a bath." The secrecy also makes it difficult for Americans to fully appreciate the horror being visited on migrant families. So we have to rely on isolated snippets to get a sense of the trauma for the children and parents. In today's connected world, we can likely expect the first-hand accounts to gradually become public, such as one recording of ten Central American children sobbing just after being separated from their parents. Then there is this account in the New Yorker magazine, of a mother from Honduras who was separated from her five-year-old son six weeks ago. They still haven't seen each other, and she's frantic she'll be deported without him: "On the afternoon of their second day in detention, two male agents entered the cell. 'They didn't say anything,' Rivera told me. 'They just walked over and grabbed Jairo. It felt like my son was stuck to me. He clung to me, cried and screamed. They had to pull him away.' She pleaded with the agents to tell her what was going on. The other women in the cell were too stunned to speak, Rivera told me. In the next few hours, the agents started taking other children, too." The contradictory and confusing explanations offered by officials overseeing the entire child-separation horror are also designed to suggest that no one is responsible for the outrage. That helps communicate that the events are somehow blips, exceptions, not part of any larger goal. The President has been the master of the double talk going on, seeming to change his tune by the day and hour. At several points he has blamed Democrats for somehow having "signed" something that has forced his hand, making the family separations mandatory. Except there is nothing except the policy of his own attorney general, which Trump presumably approved. Then on Monday the White House, in a press release, followed yet another path: "The harshest family separation policy is that too many Americans have been permanently separated from loved ones because of crime spilling across our border." The statement then referred to examples of American citizens who have been victimized by crime from migrants. The larger message inherent in the immigration tyranny is that it could be more widely applied to American citizens regarded as enemies--journalists, university professors, opposition politicians"..the list is endless. That larger message becomes clearer by the day in the refusal of the administration to back down in the face of widespread domestic criticism and even international condemnation. Certainly putting law enforcement people through the repeated heartbreaking exercise of breaking up families and imprisoning children will serve to harden them for the real work that could be coming up before long. Is there anything the majority horrified by the forcible separation of families at the border can do to counter the tyranny? One obvious remedy would be for two-thirds of the U.S. House and Senate to pass legislation prohibiting the practice. Such a majority would override a Presidential veto. Another action has already begun by governors-- at least five have committed to not sending National Guard troops from their states to the U.S.-Mexican border. Trump in April said he planned to deploy 2,000-4,000 National Guard troops at the border. Then there is the upcoming mid-term election in November. The stakes will be very high. Tyrannical rule, once launched, isn't easily repulsed.